Across the world, science is developing every single day. 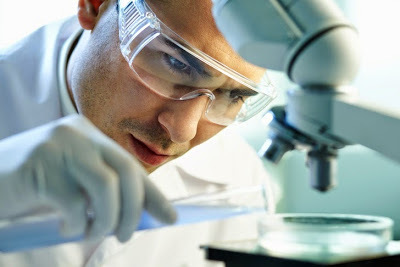 And with continued improvements in our resources for research, facilities and technology, it is not unreasonable to suggest that we will have discovered a cure for most major illnesses and conditions in the very near future. In regards to hair loss conditions, such as male/female pattern baldness and alopecia, there is no cure available, as the current market stands. Scientists are constantly testing and researching ways to combat forms of hair loss in men and women, and although hair loss cannot be medically reversed, it can be treated. The interesting thing is, many of the most potent hair loss treatments on the market were discovered 'accidentally' via scientific testing and research into other conditions and illnesses. For instance, Minoxidil (the only topical FDA approved solution) as a hair loss treatment was initially tested and developed for patients suffering from high blood pressure. But test results showed patients growing new hairs where previously lost. Minoxidil was initially tested with a view to developing a treatment for patients with high blood pressure - Oral minoxidil was originally used for treating high blood pressure, but patients and health care providers noticed that hair growth was a side effect of treatment. This led to the development of topical (solution applied to the skin) minoxidil for the treatment of male-pattern baldness. Researchers at Yale and Stanford have provided the most conclusive evidence to date that a rheumatoid arthritis drug can also be used to grow hair on patients with a disease that causes disfiguring hair loss. 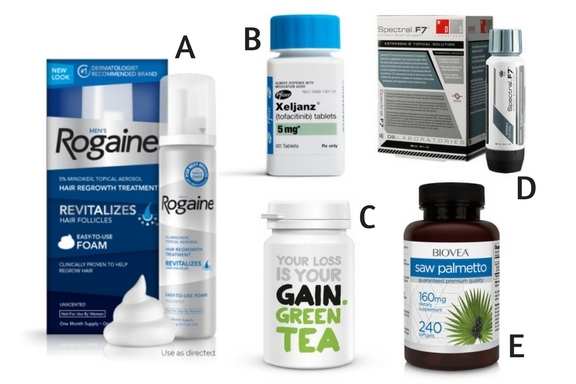 In a clinical trial involving 66 adults with alopecia areata, more than half saw hair regrowth and one-third recovered more than 50% of their initial scalp hair loss after three months of taking the arthritis drug tofacitinib citrate 5 mg, twice daily. Green tea is a potent extract that is effective for weight management. Most weight loss supplements contain a heavy dosage of green tea extract. Scientists were also pleased to discover that Green tea is a good source of panthenol. Panthenol, along with the other antioxidants present in green tea, may help in strengthening the hair and making it healthier. There is significant research available on the ability of Astressin B to reduce levels of corticotropin releasing factor, which is a product of stress. One of the commonly identified underlying causes for hair loss and thinning hair can be high levels of stress and chronic stress. This occurs due to numerous negative impacts of stress on the body, including the production of corticotropin releasing factor. Due to the ability of Astressin B to reduce the presence of chemical agents related to stress, it is possible that Astressin B may be an effective method of reducing issues of hair loss related to stress. Saw Palmetto is an effective treatment for prostate wellness in men, but during studies and testing, scientists were intrigued to discover visible signs of change in patients hair. A study suggested that a majority of hair loss sufferers lost far less hair when taking saw palmetto, and although more tests are needed, saw palmetto is regarded as a DHT blocking property.